Oat groat (cleaned, hulled and toasted oat grain) that has been steamed and flattened with a steel roller. They have a good flavor and texture when cooked and are nutritious and good for the digestive system. 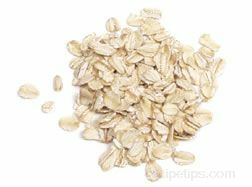 Old-fashioned oats are used for cereal, granola, bread, cookies and other baked goods. Also known as rolled oats.